The first thing I noticed about Italy when I awoke just before noon today was how much different it smells from Spain. There is a spicy, kind of sagey smell to Italy and as we looked down into the valley below Assisi I imagined the smell emanated from the countless, verdant orchards and farms below. Yep, I woke at noon. The jet lag was responsible, and maybe the cold I’ve nursed for the last ten days. My kind friends, Sebastian and Jacqueline, sneaked out quietly this morning so I could get some extra shut-eye in preparation for the many miles ahead. After an early afternoon shower I headed out to coffee and soon saw Sebi and Jacqueline walking up the hill toward the cafe near our pension. 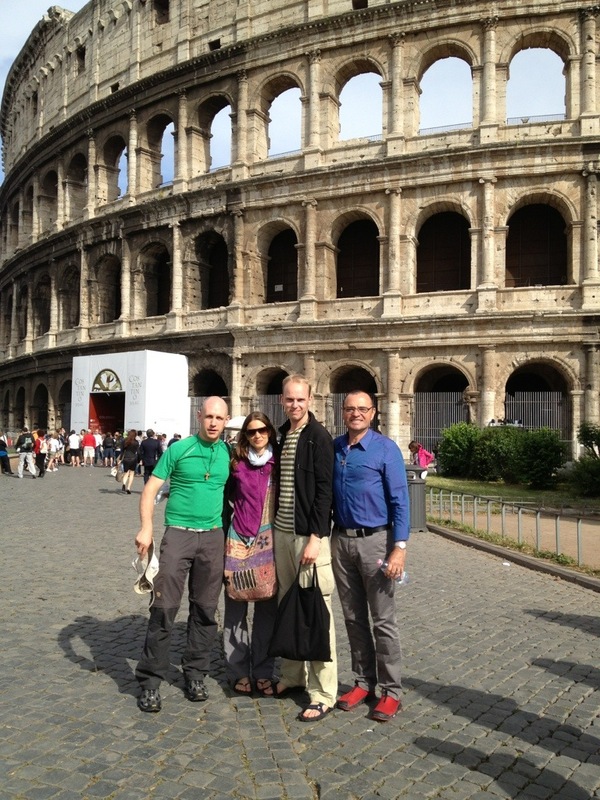 We paused for a breakfast slash lunch and then headed out for tours of Assisi’s amazing churches. 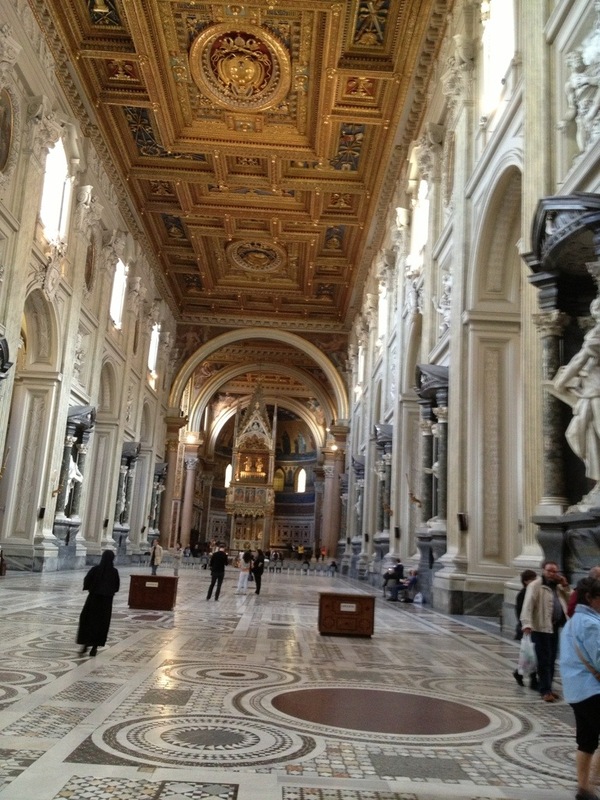 First stop was nearby San Rufino, then off to Santa Chiara with its relics of Francis and Clare. Then to San Damiano where Francis heard his mission to “rebuild the church.” From there we crossed town to the spectacular Basilica of San Francesco. When I was here in 1999 the upper church was closed for earthquake repairs. This time it was open and the historic 13th c. frescoes lived up to their billing. 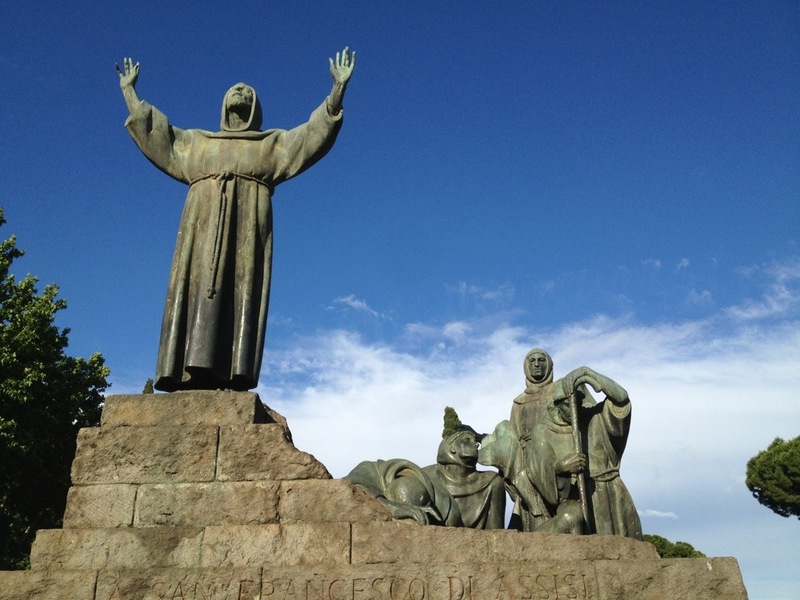 They depict in stark medieval style the important scenes from the life and death of St. Francis and the overall sense is of ancient, otherworldly mystery and power. The feeling deepened as we made our way to the lower church with its tombs of Francis and his friends. After walking the town we stopped in true pilgrim style for beers and conversation. Seated next to us in the cafe were a delightful couple, Margo and Carol, from Illinois. 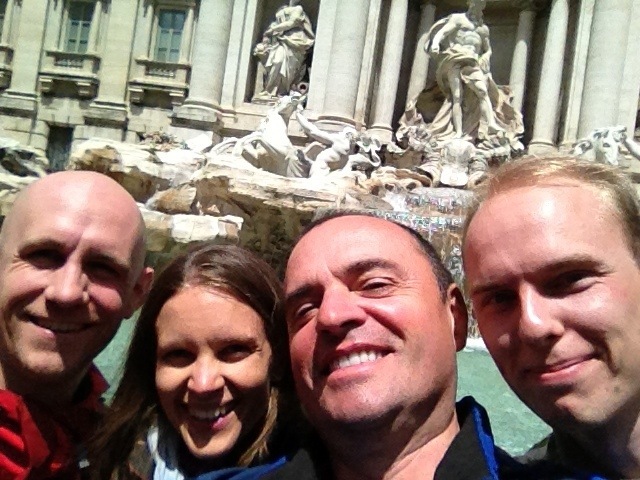 They’re touring Italy with a jolly bus group from the States which we happened to meet later at dinner. 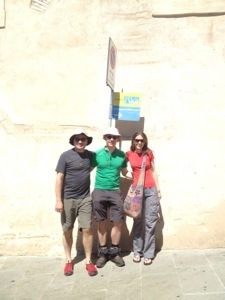 Following our meal it was back to Camere Carli for showers and sleep in advance of our first day of walking. Tomorrow’s goal: 25 km to Foligno, or if necessary, just 17 km to Spello. Cheers to friends who are following us via FB and this blog! We love you and are thankful for the many joyful wishes and prayers for a safe and fun camino 2013. Jacqueline and Sebastian study the route ahead. San Rufino, just below our room. Santa Chiara holds Clare and Francis relics. Exterior, San Damiano, downhill from Assisi. 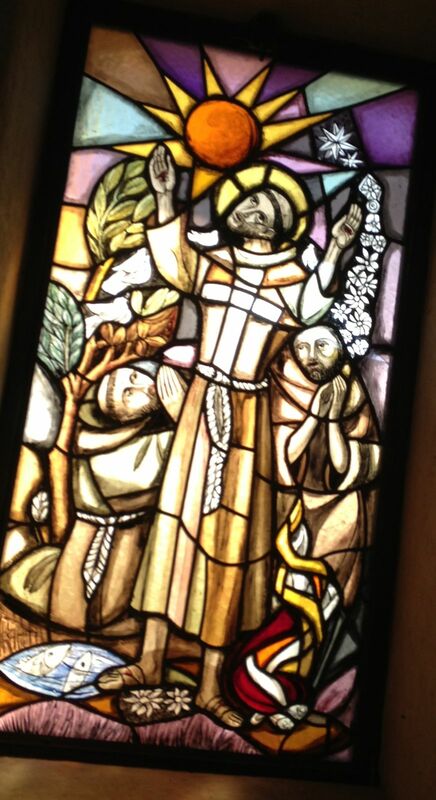 San Damiano window with St. Francis preaching to all creatures.